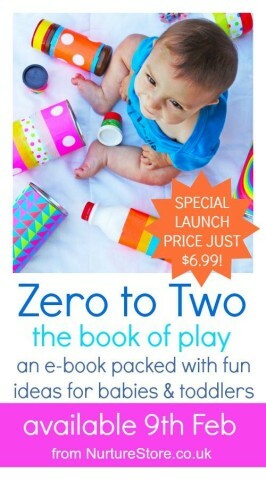 Today we introduce a book with a great collection of activities for babies and toddlers. Zero to Two: Book of Play. We have contributed a chapter to the book, be sure to read through the post and get all the details and where to buy this resourceful book. From all the online and real-life discussions I have had with parents, the one phase they feel is really challenging playtime wise is the baby phase. Typical responses include ” How do I play with a baby?”, “What can a baby do?” ” How do I teach a baby? “How do I connect with my baby?” You get the idea? During the toddler phase, it is a different kind of challenge. Toddlers are a fun, energetic and inquisitive bunch who think they are super independent and constantly testing boundaries. Coming up with activities for babies and toddlers is not easy. While they are the challenging years, the baby and toddler years are something to cherish and those 2 years go by really fast! It always feel great to get down on the floor and play with baby and your toddler? Correct? On to our book! 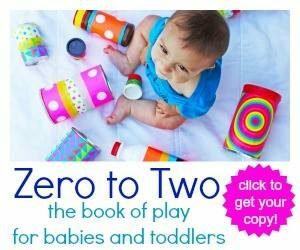 If you want more more PLAY IDEAS and more activities for babies and toddlers which are inspiring and at the same time practical, this book should come in handy. There are many play ideas to keep your wee ones busy and playing alongside mommy and daddy! Right now, there is A HUGE SALE for opening day – the book retails for $8.99 USD . You can buy this e-book in your native currency and Paypal will handle the conversion for you.